First off, congrats to the winners of the Baked cookbook and brownie giveaway: #42 Beth and #76 Pam. Please email me your shipping address! Did anyone try my cookie butter cookies? Weren't they good? Since I was so thrilled at how many uses one can use for baking with cookie butter, I made a cheesecake with it. The possibilities of this cookie butter are endless. What have you made with it? You'll need two packs of cookies. Or use one pack mixed with a combo of another hard cookie. Be as creative as you want. Gently plop down 2-3 giant globs of cookie butter, spaced apart. Then use a chopstick to gently swirl the cookie butter around. Easy peasy. cook notes: This makes a nice thick crust. If you don’t like a thick crust then use less cookies crumbs (maybe 1 & ½ cups?). In a measuring cup, crack open the eggs and egg yolks, set aside until ready to use. Bake for 15 minutes or until crust is just lightly brown around the edges, set aside and let cool. Reduce the oven heat to 300°F. 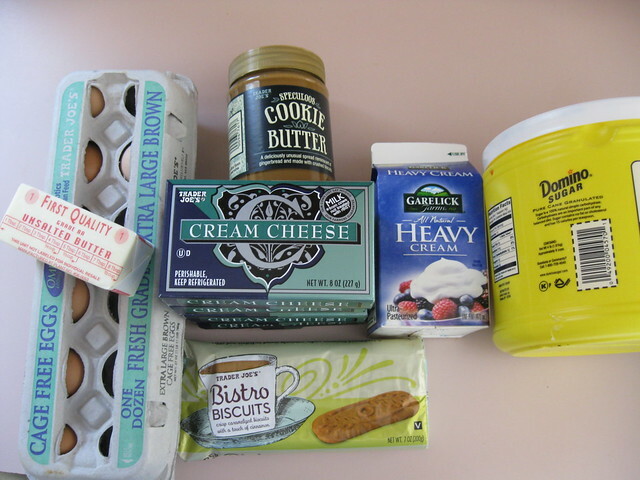 In a food processor or mixer, mix the cream cheese, with the eggs, eggs yolks, sugar and heavy cream. Mix until you have a nice custard-like consistency and no lumps are visible. Pour cheesecake batter into cooled crust pan. Take your cookie butter, and GENTLY place down three or four glops/piles, spaced evenly, around the batter. Using a chopstick (or other small, pointed stick) gently swirl the cookie butter around until you have a nice array of swirls. Most people like to do a water bath for their cheesecake. I never do, I find all too annoying. 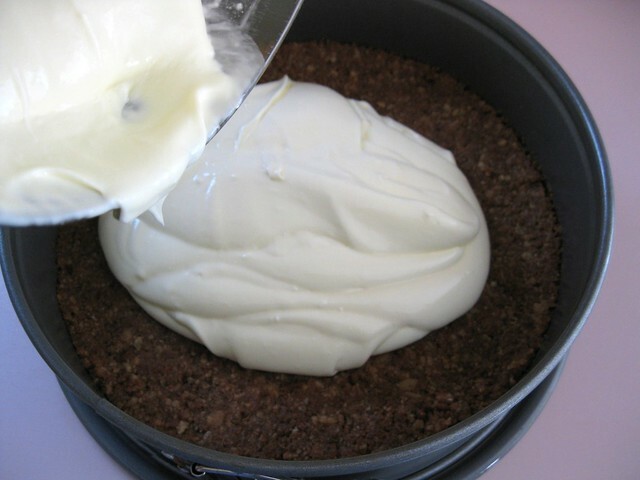 But if you want to do this feel free; it’s best to bake your cheesecake how ever you feel most comfortable. I baked this cheesecake at 300°F for 50-55 minutes; turned off oven and left it alone for a couple hours. You know the cheesecake is done when there is no jiggle in the middle and the middle batter has set up. Remove from the oven and allow to cool completely, and then you need to cover and refrigerate for at least 6 hours or overnight. When cheesecake is baking try not to open the oven door a lot, if at all. You might need a wet knife to slice cheesecake. When ready to serve, slice with a wet knife and drizzle slices with caramel sauce (optional). Our TJs finally got the cookie dough butter! I can't wait to try it out. 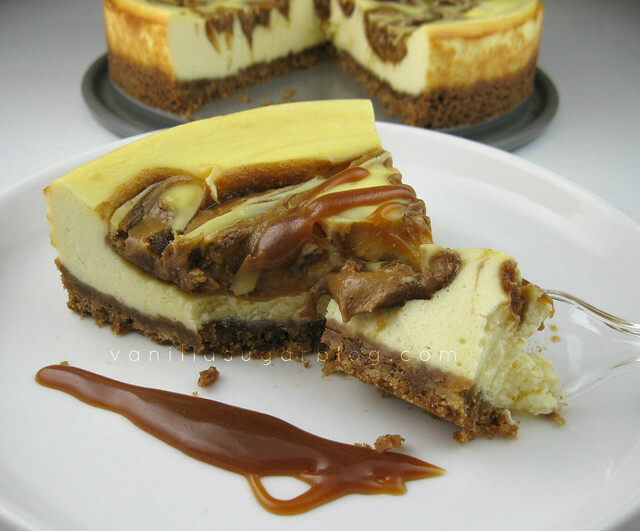 This cheesecake is drool worthy! You've done it now. SEND ME A PIECE! lol. Definitely bookmarking this too for when I get my crap out of storage. Seriously drool! I've never seen cookie butter at my TJ's! I will be on the look out next time I'm there! you know i never could find it either that's why i'm so late to the party on discovering it. i found it hidden in the peanut butter aisle. Dang. I just bought a new jar of Biscoff (which I hear is similar to cookie butter)...guess I won't be eating it with a spoon after all! This looks great - I have a jar that I've been hoarding - and now I know what to use it for! I've actually had "biscoff spread cheesecake" written on a post-it on my desk for weeks! it's like we're twins. :) and you know I'll be making this. I've tasted both biscoff and TJ's cookie butter and honestly, to me they taste the same. Karly of Buns in My Oven actually did make oreo cookie spread! I haven't tried it yet...but you know it's coming. It's beautiful. Wow, Dawn. Seriously. In love with it! I actually have a sponsored post coming out on Monday...it involves cookie butter. I think you'll like it. This, I have to make. One day soon! My god! You single-handed have officially made me hate my diet, but I'm a happier person because of it. Hehe. We need more sweets in our lives. 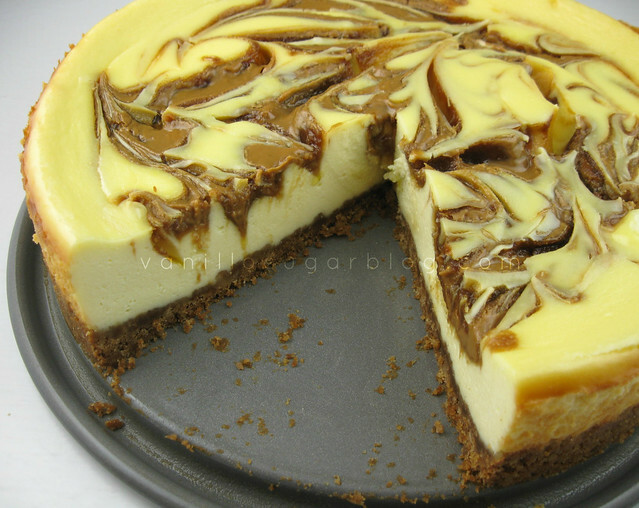 I just had breakfast but am REALLY craving a slice of this cheesecake now! This looks amazing!! You are so creative with all the different flavors you incorporate into your beautiful desserts. Wow, looks incredible and I love those swirls of goodness on top! Wow, the swirl looks so enticing. I always thought you had to add an egg yolk or something to the butter (peanut or cookie butter) to prevent it from getting dried out, though? I guess not, because this looks amazing. What a stunning, divine & absolutely FABULOUSLY looking cheesecake! Waw!!! I have tried the Biscoff spread. In fact I'm working a 12 step program in attempts to cut back. This does not help!!! I love Biscoff, a lot, and you have basically asked me, 'Want some cheesecake to go with that spread?' Um, YES! I've tried Biscoff in a little sampler on an airplane once. Wasn't so into it. Saw this at Trader Joe's the other day and was afraid to buy it (afraid for my hips). Looks like you did great things w/ it here! You have seriously outdone yourself. This looks AMAZING! oh boy. you're lucky to have stashed a slice in the veggie drawer :) looks amazing!!! OMG, I'm drooling! Is it teatime yet? This cheesecake looks incredibly scrumptious. Sure wish we had a Trader Joe's...I'd love some of that cookie butter! Guess I'll have to resort to online buying as I don't think I can resist this! how can one go wrong with a display of ingredients such as that? this is glorious, dawn! Good lord. A little slice of heaven on a plate! What is cookie butter? Cus I can't find it in kosher so I want to make it myself. This is so inviting! YUM! Just gorgeous Dawn. I am not a cheesecake person and I would INHALE a slice of that heaven. On my drive home I kept thinking about how I should go for a run. "I have a race on Sunday need to exercise, it's nice day must go for jog..." so on and so forth. Then I got online, for some reason googled cookie butter cookies, discovered your blog, and found myself eating a piece of chocolate with a dollop of cookie butter on it! darn diet ruiner! lol This cheesecake looks dangerous to my well being, but I must make it anyway! Dawn!!! Guess what I found! A Cookie Butter Recipe!!! Check it out! A blog post on Molly's site, Sugar Rush gives the recipe, so now we don't have to wait for Trader Joe's! 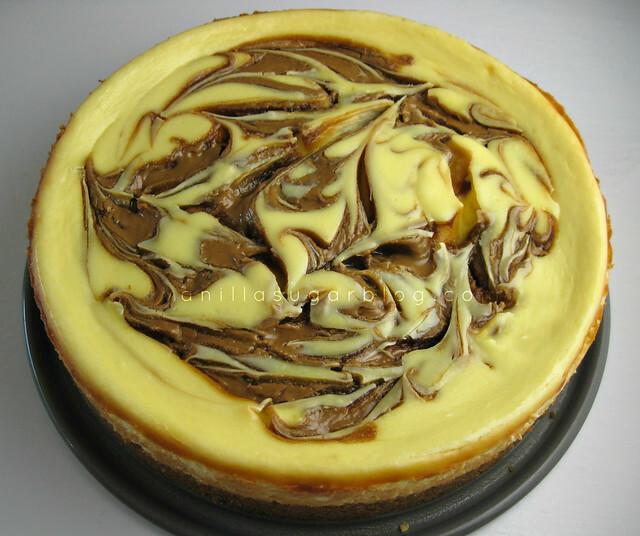 A link to your blog sent me here, and this cheesecake looks so delightful! I may or may not be able to resist! Thanks for sharing! Wow, cheesecake looks amazing! I made some Chocolate Chip Cookie Butter today that would be delicious in your recipe, thanks for the idea! 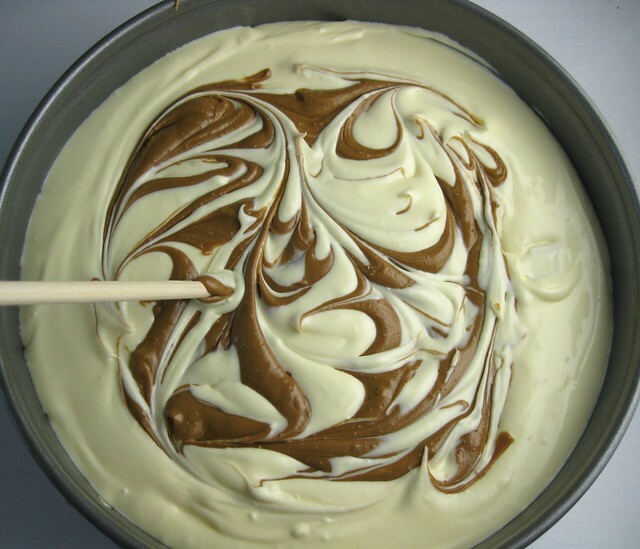 How did you get the batter so thick? Mine's looking a bit like single cream right now even after a little cornflour. Do I just keep beating it? did you end up baking it?